Fun with Maps is back with Maps 25 and 26! Let’s jump right in shall we. 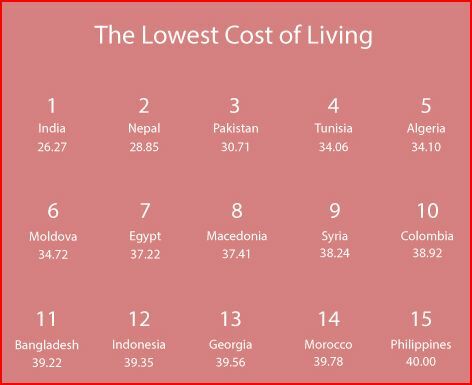 Map 25 examines the cost of living throughout the world. I found it on Business Insider (but they got it from Movehub.com). 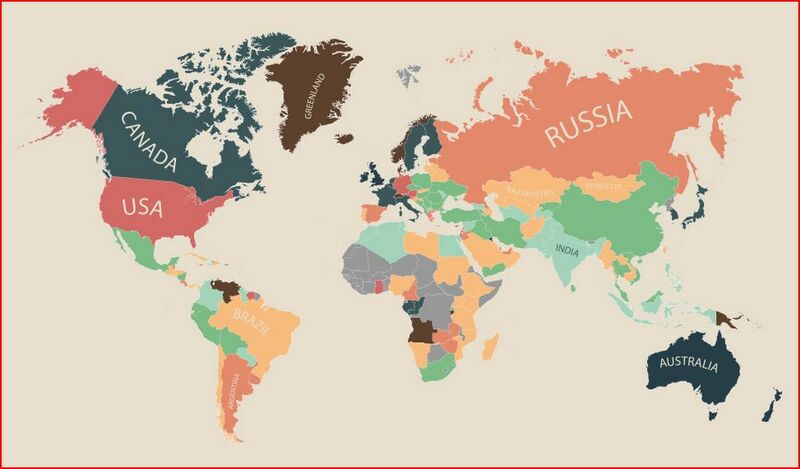 The darker colors in the map show the countries with higher cost of living. My home country of the United States sits firmly in the (upper) middle. 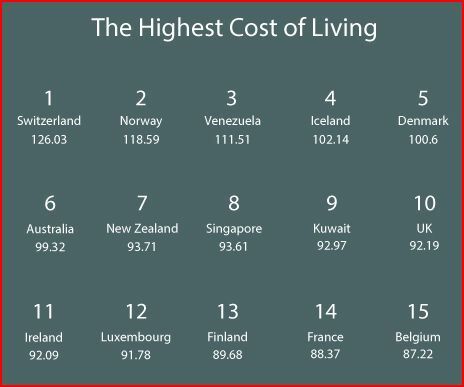 I was surprised that Canada has a higher cost of living than the United States, I thought it was comparable. Europe certainly looks to have it worse too. I guess they’ll have to get by with their centuries of history and culture. Venezuela, Australia and Japan are not off the hook either. It gives me something to ponder when I write checks for my rent, car payment, and insurance (and everything else). Maybe the prices I pay for these things aren’t so bad (they clearly could be worse). Despite the lower cost of living, I don’t picture myself moving to India any time soon. I’ve seen it on Amazing Race and it doesn’t seem like the place for me. Too crowded. Map 26 concerns the Super Bowl, the epitome of competition and spectacle in professional sports. Super Bowl XLIX takes place tomorrow, February 1st, 2015, in Glendale, Arizona. The reigning champions, the Seattle Seahawks, take on the New England Patriots for the Lombardi Trophy. While I am disappointed my Minnesota Vikings had another losing season and failed to make the playoffs, much less the Super Bowl, I will be watching the big game. As a football fan I really don’t have any reason not to watch. I may not like the competitors as much but the game should be fun. I also like to watch the commercials. I went to school for advertising (a degree I am currently not utilizing to my own dismay) and the Super Bowl is kind of a big deal for advertisers. Hundreds of millions of people watch the Super Bowl allowing [whomever actually sells the ad time] to charge $4.3 million for thirty seconds of time. Keep that in mind when you see four different Budweiser ads! This map is, admittedly, a little phoned in. It’s quite basic but all I really wanted to do was talk about the Super Bowl. But hey! I can relate this to geography somehow. Seattle is 1107 miles away from Glendale, AZ while Foxborough, MA is 2290 miles away. See, geography! With all the deflated football talk the past two weeks there hasn’t been a lot of discussion about either team and their strengths and weaknesses. One strength for Seattle might be Glendale, AZ itself. They play a game in University of Phoenix Stadium once per season against their division foe, the Arizona Cardinals. It may be a minor benefit but I bet they’ll feel more comfortable than the Patriots. New England played in Super Bowl XLII in 2008, also hosted in Glendale, and lost to the New York Giants by three. For my money, I’m betting on the Patriots (not actually betting, I’ve never been to Vegas). The Seahawks shouldn’t be worried though, I thought they were going to lose last year and they dominated the Broncos. Beth’s aunt Debbie is a huge Seahawks fan (despite being from a 49er family in the Bay Area). If they win again we’ll never hear the end of it. Good luck to everyone involved (except Marshawn Lynch, he’s only there so he won’t get fined).